As an approved FHA lender, we provide government financing with purchase mortgage opportunities for first time homebuyers and consumers with limited credit. We recommend FHA home purchase loans for people with credit issues at a great interest rate. Choose from fixed or hybrid ARM's with no pre-penalty and FHA finance only requires 3% for most purchase mortgages. FHA mortgage loans provide renters with a unique house buying opportunity at a great mortgage rate most borrowers can afford. FHA allows "gift" money and soon will have down-payment assistance programs that should increase homeownership significantly. Many times when home buyers are shopping for purchase mortgages, they forget about FHA (Federal Housing Administration) loans. Although FHA home mortgage loans were originally created in 1934 to help first-time buyers, other buyers may also qualify. Government officials continue to work with mortgage lenders on FHA expansion that would include new FHA home loans that would allow 100% financing with no deposit required. Until the lending bill passes, the 97% FHA financing is more than adequate for most first time homebuyers that appreciate the low FHA home loan rates embraced by the FHA home lending initiative by the Housing of Urban Development. A FHA loan is not actually a loan, but rather it provides insurance that the lender will receive their mortgage payment even if the buyer defaults. The cost of this insurance is passed to the borrower in the form of an upfront insurance premium (of the loan amount) and monthly insurance payments (equaling .5% of the loan amount) over the life of the loan. However, the up-front premium can be financed into the loan amount directly. And, with the new 2007 tax laws, mortgage insurance is now tax-deductible. Check with your loan advisor about recent updates and expanded home financing guidelines for FHA home loans. FHA home loans are similar to conventional loans in the respect that they offer fixed rate and variable rate purchase mortgages and interest only options, home equity loans and home equity lines of credit (HELOCs) offering flexible draw period and repayment terms. The repayment period for most FHA purchase loans is 30 years, similar to conventional loans. FHA also loans that have the potential for negative amortization where lower starting payments may not cover the interest, resulting in the unpaid interest being added to the balance. FHA rates used to be a little higher than conventional mortgages, but a lot has changed since a FHA refinance loan has become more competitive. 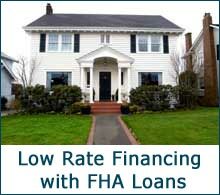 FHA home loans require a fee (of the loan amount) that must be paid at closing. This mortgage insurance insures the loan with FHA. In addition, FHA also requires an annual fee of up to 0.5% of the existing loan amount, paid in monthly installments. It is important to remember that mortgage insurance is now tax deductible and that 15 year FHA loans below 90% LTV require no mortgage insurance premium to be paid. Only a 3% down payment requirement, as opposed to 5% down or more with traditional loans. FHA loans will allow borrowers who've had some "credit problems" or those without a credit history buy a home. With conventional financing, if your score is below the minimum standard, you will not qualify or you will get a higher rate sub-prime, Alt A or A minus loan. Being able to qualify for a loan just 2 years after a bankruptcy, as opposed to the 4 years required by conventional financing. You can purchase a fixer and finance the repair costs under the FHA 203K renovation/purchase program, so you can make the necessary repairs immediately without having to come up with the money yourself. However, according to Al Cousins, renovation specialist with Wells Fargo Home Mortgage in Memphis, "Conventional renovation loans generally are more lenient and flexible. They are open to investors... FHA requires that the property be owner-occupied." Energy-efficient improvements can also be financed into your mortgage through the Energy Efficient Mortgage (EEM) program. FHA loans are great for first-time buyers and those who are low to moderate income. If the home you're looking to buy is higher priced, it's best to seek conventional financing because there is 100% home financing available through flexible 80-20 home loans, also known as no money down home loans. Be sure to find brokers that offer good faith estimates and disclosures. We still back several plans that include 100% financing, but at this time FHA does not allow a zero down mortgage. 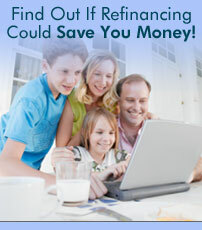 Are you interested in remodeling your home? We are approved for the 203K loan that FHA insures up to 115%.